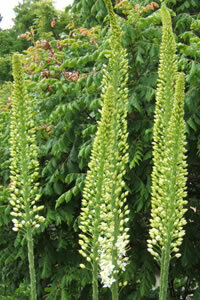 The genus Eremurus is now in the family Xanthorrhoeaceae. For maximum freshness, please keep seed refrigerated in its original packaging until it is time to plant. Sow in cold-frame in autumn or at 15 degrees Celsius in late winter. Likes full sun and shelter from wind. Fertile, sandy soil. Protect young growth with dry mulch in autumn, and provide support in windy sites. Divide brittle roots carefully after flowering.